Amazon Prime Video users from Telugu states are provided enough entertainment with few big and noted films getting released in the streaming portal. After KGF Chapter and NTR Kathanayakudu, they today have released F2 Fun & Frustration. Owing to hilarious entertainment, F2 will be prime choice for Telugu prime users. F2’s streaming in Prime Video is a big advantage for Yatra. The Anil Ravipudi directorial is still dominating box office in its fifth week. As per trade reports, F2 collected more to Yatra in few territories in last three days. With F2 available on Prime, movie lovers would watch Yatra in theaters since they have no other option this week until the release on new films for Valentine’s Day. 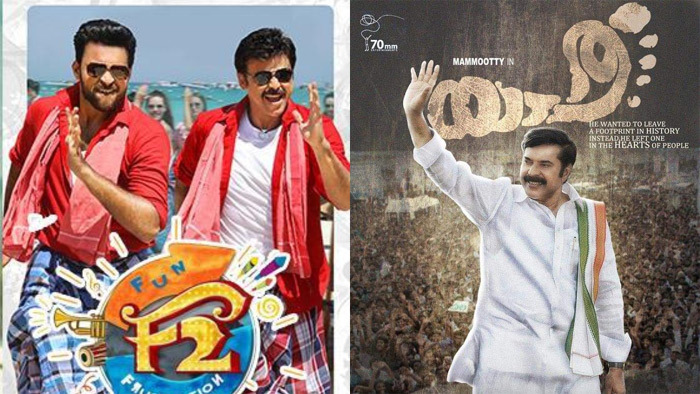 Mamootty starrer Yatra which is biopic of Andhra Pradesh farmer Chief Minister YS Rajasekhar Reddy is doing respectable business at box office. However, the Mahi V Raghav directed film’s fate depends on how it performs in week days.